Happy Monday, my dears. Not the finest day the week has to offer, is it? At least, it tends not to be. Never fear: I have something truly wonderful for you today. I first found Melanie Casey jewelry on Etsy years ago – for proof, please see my first ever holiday gift guide (right here). When I rediscovered her recently through Instagram, I was delighted to see how her brand has blossomed in the past few years: I was treated to a wide selection of lovely stacking rings, which I remembered from before, as well as entirely new collections of gorgeous original jewelry. Melanie Casey’s jewelry backstory is my favorite kind of jewelry backstory: she started out working in finance, a field that became very stressful in the housing crisis of the early 2000’s. Hoping to find a relaxing hobby, Melanie took a jewelry design class and fell in love. After gradually developing her technical ability on nights and weekends, Melanie started selling her work on Etsy and eventually made the switch to full time jewelry designer in 2011. These ruby and garnet earrings are the piece that caught my eye on Instagram. Aren’t they wonderful? Such luscious, juicy gems nestled in that knobbly gold setting. I’m a sucker for Victorian jewelry with discolored turquoises – I think the combination of all those different shades of blue and green is stunning. This ring from Melanie Casey’s Wisteria collection gives the same feeling by ringing an emerald-cut aquamarine with sapphires, turquoise, and topaz. Much like yours truly, Melanie Casey has a soft spot for antique jewelry, especially pieces that date to the 1930’s and earlier. When she told me that, I immediately thought of this morganite and diamond ring. Something about this beauty feels 1930’s to me – it’s simple silhouette, gently softened by color and curves, perhaps? I love seeing a morganite in yellow gold. I know they’re frequently set in rose gold, and I understand that choice…but I think that the way the soft pink pops gently against the yellow setting is wonderful. Rubies and garnet again. Apparently I have a weakness for this color combination. Can you blame me? Here’s something brighter. I love how the pearls around this citrine wake up the brightness of the central stone. Can I interest anyone in some brilliantly colored gemstone earrings? I think both of these are great, but it’s the gently faceted pair of peridots in the back that really caught my eye. This ring is one of my personal favorites: a beautiful, marquise-cut blue kyanite set on a band of delicate gold leaves. I love the contrast between the crisp points of the kyanite’s bezel and the more plumply rounded leaves of the band. Here are a few of the classic Melanie Casey stacking ring sets – they come in rose, yellow, and white gold; all kinds of textures, and in almost any gemstone. The possibilities for customization are endless. These three beauties are billed as wedding bands, but I think they’d be fantastic on any finger. Which is your favorite? All images and info in this post are thanks to the fabulous Melanie Casey jewelry. Find these pieces and more on Melanie Casey’s website. Photo recap: JCK Privé NY. Happy August 22nd, everyone! Today is my one year blogiversary (a word that I both detest and cannot resist using). Happy birthday, Diamonds in the Library!! I’ve come a long way since last August, when I could look at my stats and trace each page view back to a member of my family. Thank you for reading, my lovelies. You make the ride worthwhile. 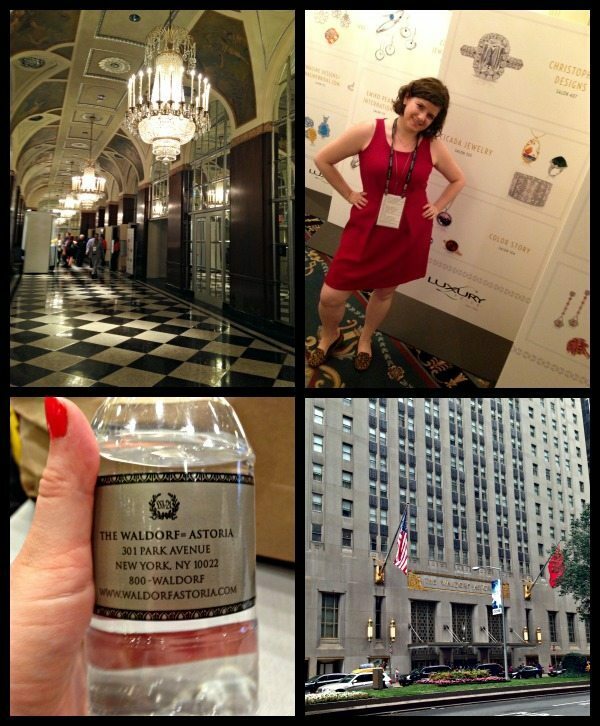 A few weeks ago, I had the honor of attending the JCK Privé NY Luxury Jewelry Trade Show. I was invited to the Editor’s Press preview, a beautifully curated selection of fabulous new designer jewelry, and given the run of the private convention for day. Room after room full of jewels, showcased against the backdrop of The Pierre, a glamorous NYC hotel. I was glad I had a four hour bus ride home to DC because I needed almost that long to be able to speak coherently again. Severe sparkleshock. I was also tickled pink to see a press release about JCK Privé NY referring to me one of “jewelry and fashion’s most influential journalists and bloggers” in the same list as Vogue, Marie Claire, Robb Report, Martha Stewart Weddings, and iDazzle. I have lots of lovely professional photos to share with you, but I’d thought I’d start us out with the shots I took myself – give you a peek of what’s in store, and let you share the show with me as I experienced it. These babies were one of my favorite pieces of the entire show. They’re Paraiba tourmaline – an incredibly rare gemstone prized for its incredible color – and diamonds in platinum, by Rina Limor. It was really hard to take these off. I gave you a peek at this gold and gemstone ring by Temple St. Claire up above. I was head over heels for its lovely colors and wearable shape. 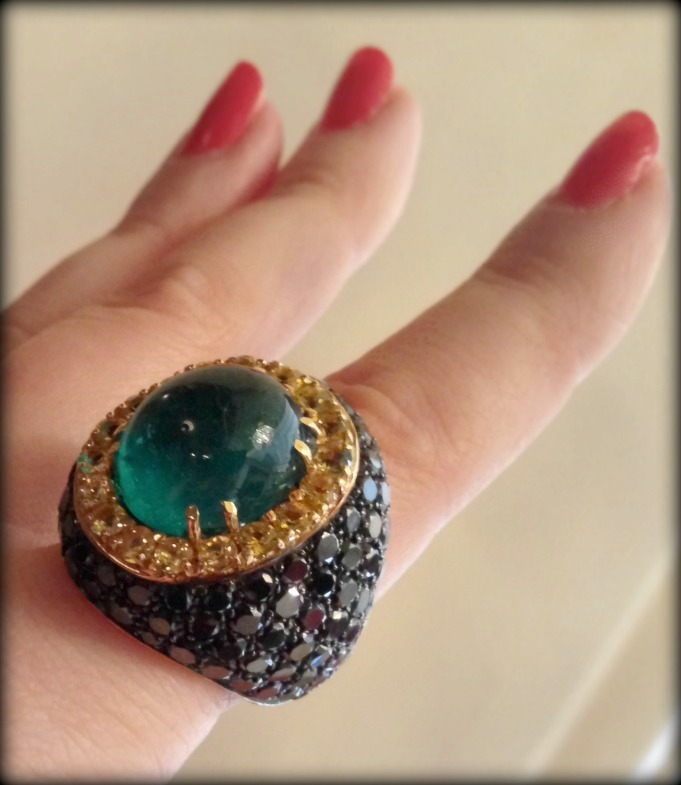 Two incredible statement rings by Sethi Couture. Doesn’t the one on the left look like a funky, diamond-encrusted pretzel? I mean that in the best way. This 36″ labradorite and gold necklace by Susan Wheeler Designs is such wearable luxury. I still can’t believe I’m allowed to touch things like this Yael morganite and diamond ring in rose gold. A princess of a ring, if I’ve ever seen one. Here, I took a video. This amethyst and diamond pendant is by Yael too – a glorious, shining to that sassy pixie of Disney fame, Tinkerbell. It is perfect. There’s a pendant loop behind her upraised wing. Incredible diamond and emerald earrings by Omi Privé. Here’s a closer view of the two amazing Omi Privé sapphire and pink sapphire and diamond cocktail rings I showed you near the top of the post. The best part here, though, you can’t even see from above. 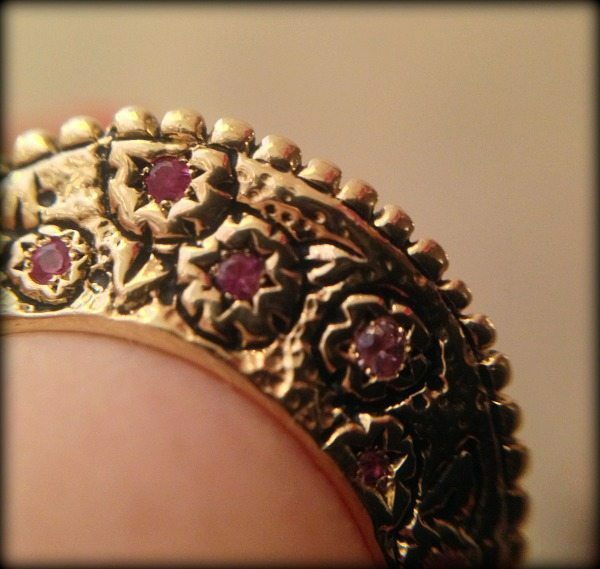 Check out the detail on the pink sapphire ring – rose gold, diamond, and small pink sapphire accents hiding underneath! I think my favorite new designer discovery of the day was Naomi Blumenthal – this impossibly delicate, perfectly crafted gold necklace will be occupying a spot on the wishlist of my dreams forevermore. Here’s a bolder look, also by Naomi Blumenthal – this necklace features the same detailed goldwork in a longer necklace with larger elements. Have you ever seen a prettier snake than this one by Anthony Lent? Finally – this swoonworthy bow and arrow pendant by India Hicks. So delicate and perfectly crafted; a tiny piece of art you could wear every day. Which do you like best of these fabulous JCK Privé NY jewels? A hard choice, I know, but I want to know what you think! A huge and heartfelt thank you to the folks at JCK, the marvelous ladies at Communique LA, and all of the wonderful brand representatives at JCK Privé NY for helping make my first luxury trade show experience a glorious one. There’s more to come – I haven’t even gotten to Mimi So and Oscar Heyman! Morganite and aquamarine necklace, Michele della Valle. I’m not completely sure if I like this necklace as a necklace but I definitely think it’s impressive. It’s also definitely enjoyable to look at just as an object. You see my point? It looks sort of like a scrunchie with little plastic beads, or a necklace that a very fancy My Little Pony would wear. But it’s made of real, faceted aquamarine and morganite beads, with a large, cushion-shaped morganite clasp. The colors are certainly beautiful. I can’t help but wonder if it’s heavy to wear. It sort of says nutty old lady to me…but I do look forward to being a nutty old lady and I think this could be styled fabulously by someone who knew what they were doing. What do you think? This necklace was listed in Sotheby’s November 2012 Magnificent Jewels sale. All images and info are thanks to Sotheby’s. Pink jewels from the Tiffany & Co. Blue Book. The Tiffany & Co. Blue Book is out! That means that we have many new beauties to behold. Because I needed some kind of theme, we’re going to focus on pink jewels today. I thought I’d start out the pink jewel parade with this bracelet. It looks sort of like a sunrise when it’s at that angle, don’t you think? It also reminds me somewhat of this spectacular ring, which I know you like. This incredible piece is platinum set with diamonds and lined in rose gold. Oh yeah: and one very exceptional 74.63-carat morganite. That’s the pink beauty you’re drooling over there in the middle. Not too shabby. A lovely floral ring in pink and white diamonds. I hope my April showers bring this kind of May flower. While we’re at it…why not pink jewels for every finger? I think these show a clear Art Deco influence, possibly inspired by Tiffany’s recent designs for the Great Gatsby movie (don’t worry, I’ll show you those soon). Here’s a stunning detail shot of a diamond and pink diamond bracelet from the same collection. I haven’t been able to find a full view of this – if you have more info on it, please let me know! Here’s a similar and equally to-die-for pink diamond and white diamond pendant. Isn’t it lovely? It reminds me of rose windows. And last but not least, some diamond and pink diamond earrings to match all of the pink-focused rings and bracelets we’re all coveting now. There’s more Blue Book to come, so stay tuned! If you can’t wait for your Tiffany’s fix, go check out my Tiffany & Co Pinterest board. The first image of the morganite and diamond bracelet is via The Jewellery Editor. All other images and info in this pink jewels post are thanks to Tiffany & Co, via Pinterest and Tumblr. Brumani Sissi Collection necklace and earrings. Below are a pair of earrings and a necklace from the Brumani Sissi Couture Collection, which, as you may have surmised, was inspired by the Empress Sissi. The earrings are set with diamonds and morganite drops. They’re bold with delicate details. They’re lovely and would go wonderfully with abundant dark hair like Sissi’s. I love the subtle wildness of the unevenly-set diamonds on the larger hoops. It’s such a wonderful contrast to the elegance of the pretty pink morganites. And those central morganite drops look like they’re articulated to tremble with the wearer’s movement. This Brumani Sissi collection necklace is also set with morganite and diamonds. I think this set is gorgeous and it’s begging to be worn with a rich, jewel-toned gown. You can always count on attention to detail and superb craftsmanship in Brumani’s pieces. This necklace displays the same slightly chaotic diamond placement as the earrings and I may love it even more here. I’d love to see this beauty in action, with the diamonds catching the light as its lucky wearer moves (through a royal ballroom or a grocery store or wherever she may need to be). And how delicious is that large morganite drop? All images and info on these Brumani Sissi collection pieces thanks to CIJ Jewellery magazine and Brumani.